Fully renovated and furnished vacation home in a gated community, walking distance to downtown. The two bathrooms are fully renovated with rain showers. The kitchen has quartz counter tops and a bar with three stools. There is also an ensuite washer/dryer. Enjoy all Palm Springs has to offer: Golfing, Hiking, Biking, Swimming, Tennis, Theatres, Museums, Art Galleries, Restaurants, Casinos and everything in between. Snowbirds, this is the perfect place to escape the Cold Canadian Winters! This 916 square foot two bedroom, two bathroom condominium was purchased in May 2008. The condo has been fully renovated, freshly painted and contains modern furniture, linens and everything else you need for your home away from home. Come home and relax on the leather sofa or sit on the patio and enjoy the pool and mountain views. For the energetic types you can swim in one of the two heated pools or play tennis on one of the five tennis courts. Don't forget to check out one of the two hot tubs. The master bedroom contains a queen size bed with energy-absorbing foam mattress, 32' flat panel LCD TV and a master ensuite with sink, toilet and rain shower. The second bedroom has a queen size bed with energy-absorbing foam mattress. The second bathroom has a sink, toilet and rain shower. The living room has a 48' HD flat panel LCD TV. There is a sofa as well as three arm chairs. The dining room has a table and six chairs. The patio has a table and four chairs for outdoor dining. Enjoy a month long retreat to recharge your body and mind our accommodations will exceed your expectations. We had been vacationing in Palm Springs for over 15 years before purchasing our condo. We live in the unit part of the year so we are able to keep on top of maintenance etc. It also means that the kitchen is particularly well equipped. 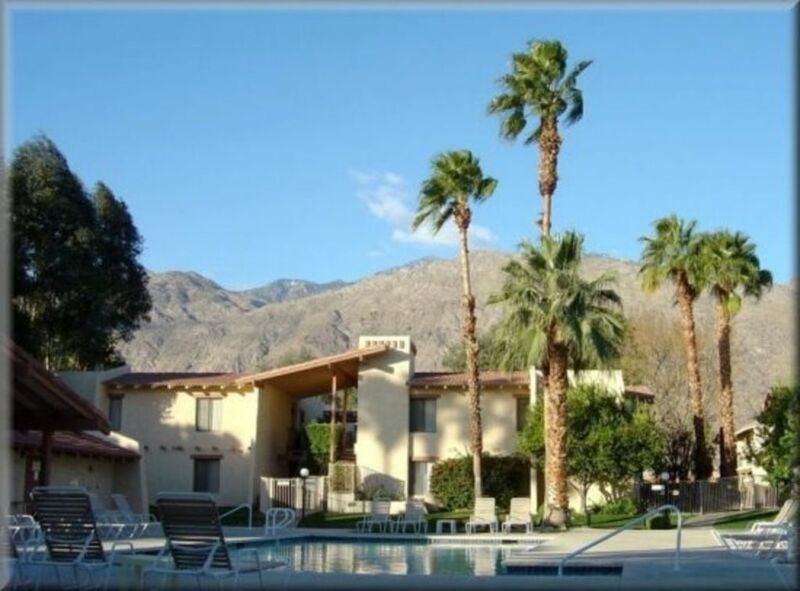 A wonderful,well stocked, clean, well located condo near downtown Palm Springs. We had a fabulous time at the pool,relaxing in the hot tub, grilling on the large gas grill, walking to town, or simply relaxing in this very spacious condo or watching the hummingbirds on the patio. We highly recommend this very comfortable vacation spot. The owners were very easy to deal with and very responsive. We stayed in #110 for March 09. It was truly a great experience. The condo is open, bright, comfortable, well stocked with all the amenities. It is 11 steps to the pool and the bbq. The humming birds visited frequently, the scenery was wonderful. We look forward to going back in 2010. Our stay at #110 was fabulous. The condo was in a great location, close to DT & various amenities such as library, banks and stores. The BBQ, pool, hot tub,laundry room and tennis courts area were well maintained. The condo itself was tastefully decorated, colorful, comfortable, clean and well-equiped. The owners, management and neighbours were friendly and helpful which contributed to our wonderful stay. Evertything about this rental was excellent. The condo was attractive, comfortable & well-furnished. It was perfectly situated in the complex. The complex was impressively well-cared for, including the pristine warm pools & hot tubs. The location is quiet, yet convenient to everything. The owners were very pleasant to deal with. We definitely plan to return! If you cancel and we are able to rent the property for that period we will give a 100% refund.